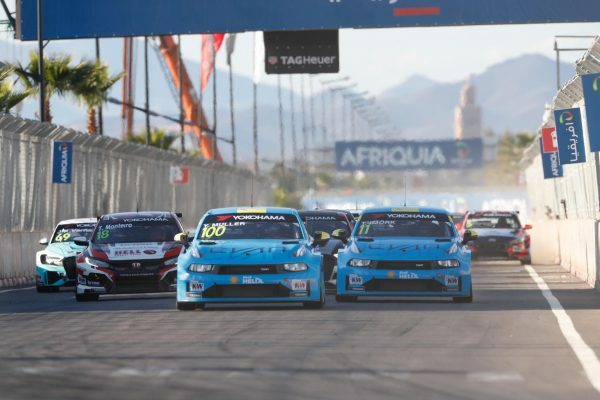 Thed Björk scored a maiden victory for Cyan Racing Lynk & Co after his team-mate Yvan Muller was forced to retire from the lead with a steering problem as WTCR AFRIQUIA Race of Morocco concluded with a dramatic Race 3 in Marrakech. Muller and Björk both got the jump on DHL Pole Position starter Frédéric Vervisch in his Comtoyou Team Audi Sport RS 3 LMS and looked set for a famous one-two in the first race weekend for the new Lynk & Co 03 TCR, developed by Geely Group Motorsport from China. But having opened up a gap, Muller slowed on lap 14 to allow Björk to take the victory, confirming three different winners from three different customer car brands in Marrakech. Race 3 proved to be full of drama from the start. As Muller and Björk took advantage of passing Vervisch from the lights, a three-way battle ended with two cars in the wall at Turn 7. Race 1 winner Esteban Guerrieri made a move down the inside of Tiago Monteiro’s KCMG Honda after the Portuguese had cut the chicane. But with Yann Ehrlacher tearing up the outside, Monteiro was left with nowhere to go as the trio entered the turn together and his Honda tagged the Lynk & Co 03 TCR. Both were out on the spot, as Guerrieri continued in fifth place. The safety car was called upon while the cars were cleared from the track, but action resumed on lap six as Muller made a break at the front. But Björk, Vervisch and impressive newcomer Mikel Azcona in his PWR Racing CUPRA TCR suddenly closed in and Muller slowed with his car in undrivable condition. Björk faced pressure from both Vervisch and Azcona, but the tension was released on lap 20 of 23 when Jean-Karl Vernay crashed heavily in his Leopard Racing Team Audi Sport RS 3 LMS. Vernay hit a tyre wall backwards with force, but walked away from the heavily damaged car. The accident inevitably forced a second safety car period and Björk took the chequered flag just as racing resumed. Vervisch had to be satisfied with second despite his disappointing start from the DHL Pole Position, while Azcona was delighted with a podium finish on his and PWR’s first weekend in the WTCR /OSCARO. Behind the podium finishers, Guerrieri added to his Race 1 win with more solid points for fourth, as did Race 2 winner Gabriele Tarquini in fifth. Race 1 podium finisher Néstor Girolami completed the top six in his ALL-INKL.COM Münnich Motorsport Honda. Gordon Shedden ended a difficult weekend with a strong seventh in his Audi, while Norbert Michelisz claimed eighth in his Hyundai i30 N TCR ahead of Team Mulsanne’s Ma Qinghua in his Alfa Romeo Giulietta TCR. PWR Racing’s other rookie Daniel Haglöf completed a great weekend for the team with a P10 finish. KCMG’s Attila Tassi scored points in P11, while local hero Mehdi Bennani finally made the chequered flag in P12 in his SLR VW Motorsport Golf GTI TCR. The final points-scoring finishers were Andy Priaulx, after a eventful maiden weekend in the WTCR / OSCARO, Tom Coronel and Rob Huff. Bennani also bagged the TAG Heuer Best Lap Trophy for his Race 3 charge. Augusto Farfus missed out on a points finish on his debut for BRC Hyundai N LUKOIL Racing Team entry after retiring with a gearbox problem while running in P10.